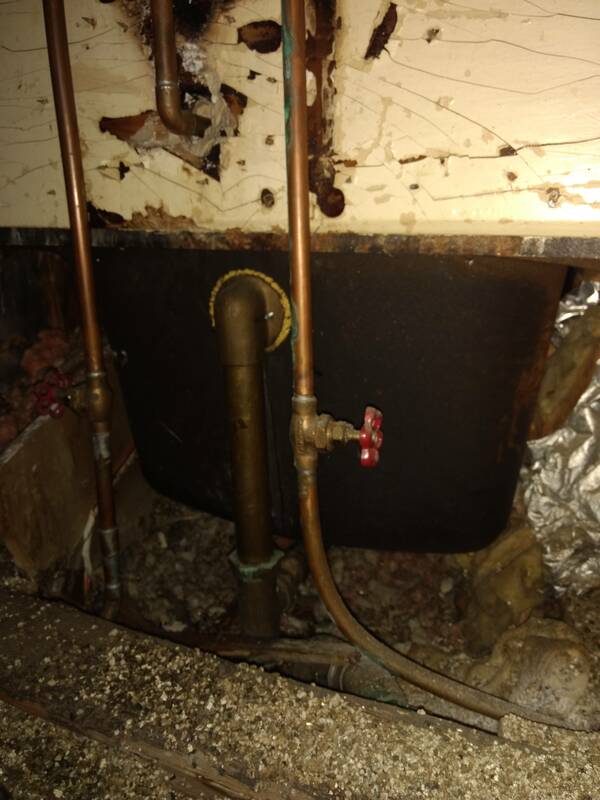 Shower pipe repair, how do I get to the pipe that goes to the shower head? The most likely culprit is the shower drain, take a bucket of water and pour it down the shower drain, if you hear water dripping or see it on the kitchen ceiling, you have found the cause. Most homes have a trap door or service panel to access the tub drain plumbing, this will be in the wall behind the tub. Open it up and look for signs of water, if it looks ok, run the shower and check again for leaks. If you see no water it may be in the shower arm which holds the shower head, remove the shower head, and unscrew the shower arm, it screws into a brass fitting inside the wall, the problem usually is the shower arm. If it looks rusty or has a pin hole leak replace it. 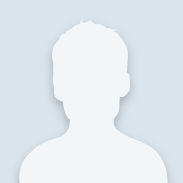 Hello Steveo1984 and welcome to the Community. If after taking the steps that Mike has suggested and you still have a leak, you may consider the following. The key to finding any leak is to be able to see the leak in action. Open up the wall that is getting wet, (In your case the Kitchen ceiling), then water-test the area. Measure from the kitchen ceiling side where the water is coming from and use those measurements in the bathroom to find the origin. It may be a leaky pipe but it could be a bad seal around the shower base where latex caulk could have shrunk, a shower door, shower curtain, or a bad seal around the drain. If you cannot reproduce the leak while you watch, DON"T try to fix anything. Once you have determined the source you can them start to fix the leak. Taking this approach could save you from needless demolition. If you have determined that it is a leaking pipe you may have to remove the tile and wallboard to access the pipes and repair them. If you share the results of the search for the leak, then we can be more detailed in how to fix it. Thank you both for your input. The reason why I was certain the shower part was where the leak is coming from was because I had the bath faucet on for a good 4 minutes and not a single drop took place :) I'm gonna start with the shower arm and see how that looks. Thank you both for your input. The reason why I was certain the shower part was where the leak is coming from was because I had the bath faucet on for a good 4 minutes and not a single drop took place :) I&#39;m gonna start with the shower arm and see how that looks. Since the leak you have does not occur when only the bath tub spout is being used, you have narrowed down the possibilities to that shower arm and the pipe that leads to it. This could really be good news, as you may be able to fix the leak without getting inside the shower wall. 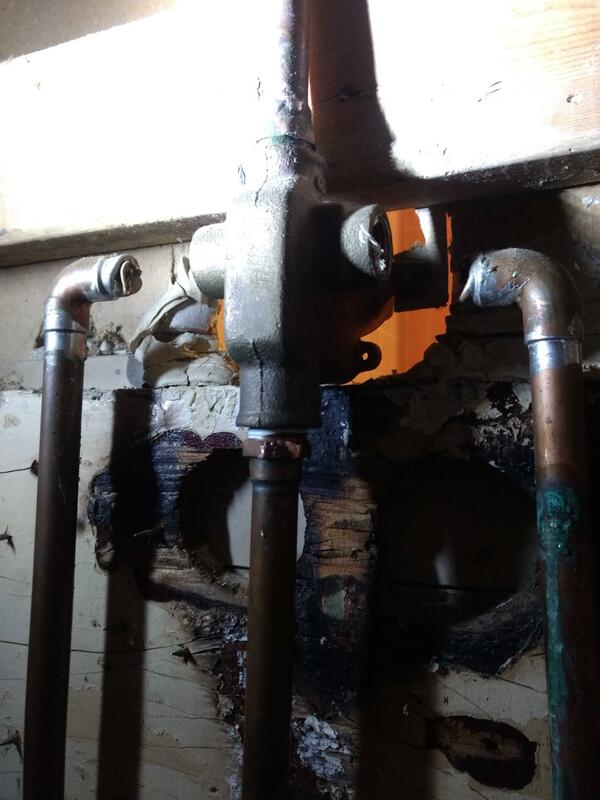 While it is possible that the vertical pipe leading up to where the shower arm mounts has cracked or has leaking joints, it is less likely because this pipe and its top elbow should be securely mounted to wood supports. See the picture below of a typical elbow. It will be the connection for the shower arm, and has ears on it to keep it from moving. The other end of the pipe attaches to the shower valve, and it too should be securely mounted to prevent any movement. That is why the most likely place for a leak will be where the arm threads into that eared elbow. The shower arm you see screws into this elbow. It over time gets pushed around as the shower head is adjusted, and pulled around due to the hand held shower tubing. 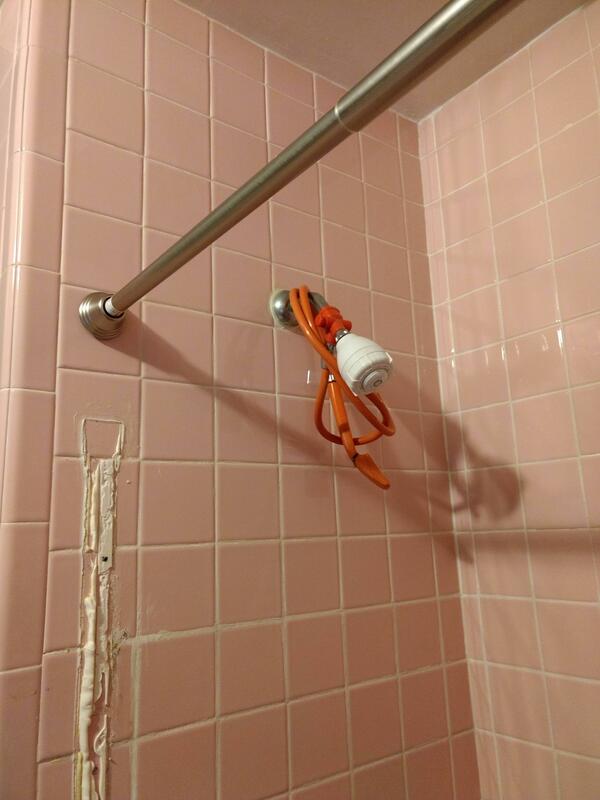 With any luck, you should be able to easily unscrew that shower arm. Remove the shower head and adapter and carve away the caulk holding the escutcheon, (trim ring), and pull it away from the wall and off the pipe. Gently try to move the arm around to see if that elbow is still securely mounted. If it is, then carefully unscrew the arm and remove it. Inspect it carefully for cracks in the thread and buy a new one if in doubt. Use a good quality pipe dope rather than Teflon tape on the new threads and install the arm. Hopefully that will fix your leak. If that elbow was free to move around, then all bets are off and behind the wall access will be necessary. So I found an access panel to the pipes that lead up to the shower head and bath tub faucet. It was the next room over, where the wall was behind the bath tub location. I was able to see where the water was coming from when the shower was on. Im wondering if there's lack of sealant from moisture getting through the tub and tile walls, or if the device that switches to shower option wasn't installed securely? I have circled in red where the leak(s) are coming from, and red arrows pointing to where the water ends up that causes dripping through the kitchen ceiling downstairs..
Really got a good mess started. Hope the part where the hot and cold connect to is replaceable?